Based on Virginia Woolf and her sister Vanessa Bell’s childhood, this is a superb story of a sister’s fight to help her sibling battle depression, through the power of love and art. The visual metaphors of changing moods are striking, such as the use of dark coloured silhouettes expressing the depth of depression, and the colour yellow as a representation of Vanessa and her fight to get Virginia out of the darkness. 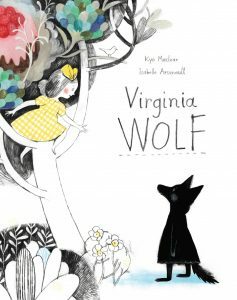 This allows this difficult subject to be made more accessible for young children , as does Virginia’s transformation into the wolf, which allows her harsh words towards her sister to be somewhat softened, as she not herself. This is a beautiful, outstanding picturebook which works on many levels. 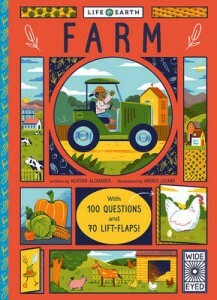 “Farm” is part of the Life on Earth series, a new ludic, engaging and beautifully packaged fact-filled non-fiction series which uses 100 questions to investigate topics which are perennially popular with children. Each double-spread focusses on a sub-topic, and is really well designed, using vignettes and flaps (of which there are 70!) which hide some of the answers for added interactivity. 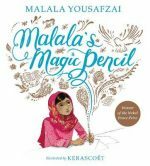 It is quite text-heavy so younger readers might need a lot of adult participation, but with really bright, clear attractive artwork, there is plenty for children to enjoy on their own too. This series retains the sophisticated style we are used to with Wide Eyed while being really well pitched at its audience; it is sure to be a hit! 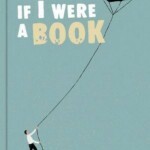 The first thing that will undoubtedly strike the adult readers of this book is the narrator’s voice. Told in first person by the P.I. in question, it perfectly emulates old detective movies and this theme runs throughout, in the narrative as well as the cinematographic style of the artwork and the design of the book. However, while an homage to film noir, this is an updated version of this often gendered and not very inclusive genre, with everyone being empowered in the end. McLaren has crammed so many details and references, many readings will be needed to fully appreciate and notice it all. For all these references which are obviously more aimed at adults, at the core is a hugely enjoyable detective story, full of drama and jokes, which children will love. 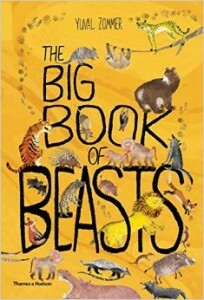 This large format non-fiction picturebook introduces an array of beasts, from small bats to huge mammoths. Each double-spread focuses on an species, with accessible, short sentences in small paragraphs presenting information about its behaviour. This is accompanied by wonderfully zany artwork which complements the text by offering detailed depictions of their habitats. Zommer’s beasts have wonderful expressions, and readers can see a hint of what their ‘background stories’ might be, opening many opportunities for extension activities both at home and school, including storytelling and creative writing. 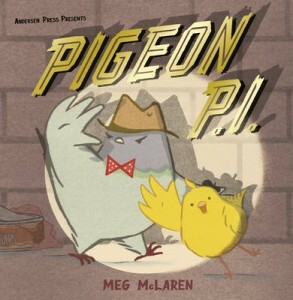 A lovely book which is a fun, child-friendly first introduction to factual books.